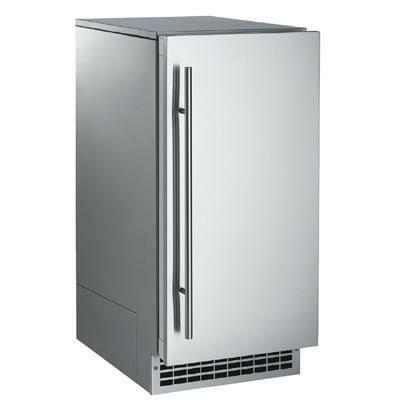 Scotsman 60lb Gourmet Ice Machine. 15" cabinet width, produces up to 80 lbs. of gourmet ice in 24 hours. Stores up to 26 lbs". Nugget ice is made from bits of compacted ice that are soft, chewable and absorb the flavor of the beverage. 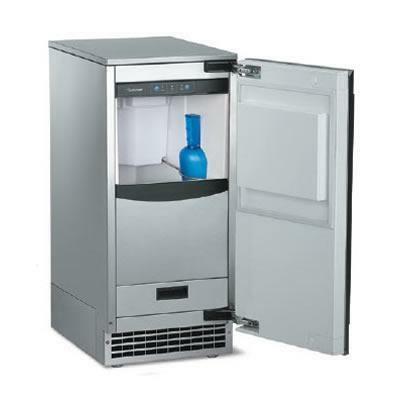 Uses 40% less energy and more than 50% less water than stand-alone, dedicated ice machines.User-friendly control panel informs whether power is on, alerts a no-water condition, and a time to clean reminder. Outdoor approve. Large, slowmelting ice form, ideal for mixed drinks. • Uniquely-shaped, crystal-clear, slow-melting, taste-free, odorless ice, won't dilute the flavor of drinks. • Water-quality sensor detects hard water conditions and control system purges mineral laden water with every harvest cycle, which helps extend the time between cleanings. • Lighted bin and self-closing door. 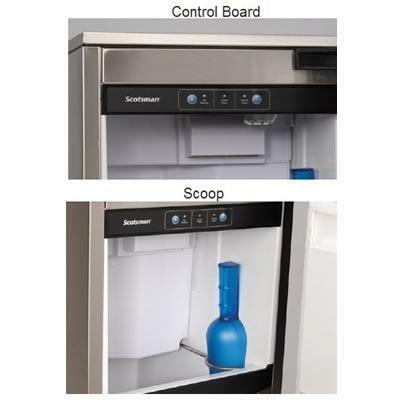 • User-friendly control panel informs whether power is on, alerts a no-water condition, and a time to clean reminder. • Air Temperatures: 50°F (10°C) - 100°F (38°C). • Water Temperatures: 40°F (4.4°C) - 100°F (38°C).